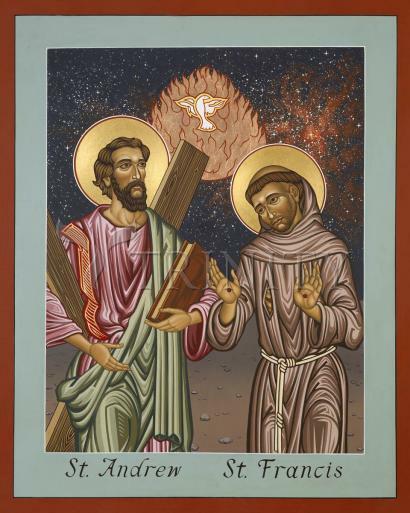 St. Andrew, “Troparion,” first called of all Christ’s apostles, and St. Francis, first called of Christ’s renewed church (“…build up my house, for it is nearly in ruin.”). The painter\\ iconographer ‘El Greco’ created an image of these two together that inspired this icon, but why these two together? Their feast days are November 30 and October 4. After Andrew had stayed with Jesus and had learned much from him, he did not keep this treasure to himself, but hastened to share it with his brother Peter. Notice what Andrew said to him: "We have found the Messiah, that is to say, the Christ." Notice how his words reveal what he has learned in so short a time. They show the power of the master who has convinced them of this truth. Andrew's words reveal a soul waiting with the utmost longing for the coming of the Messiah, looking forward to his appearing from heaven, rejoicing when he does appear, and hastening to announce to great an event to others. To support one another in the things of the spirit is the true sign of good will between brothers, loving kinship and sincere affection.